Today, his name is a household word. Wally founded the Read it LOUD! Foundation in 2005 urging parents and caregivers to read aloud to children for at least 10 minutes each day from birth to six years old. Read it LOUD is partnered with MARSYS, the Library of Congress, First Book, The Heart of America, The Children's Book Council, American Library Association and Nemours to launch a national campaign. In 1994 he co-founded the Uncle Wally's Muffin Company, which produces a full line of muffins. As founder of Famous Amos Cookies in 1975 and father of the gourmet chocolate chip cookie industry, he has used his fame to support educational causes. Wally was National Spokesman for Literacy Volunteers of America from 1979 until 2002 when they merged with Laubach Literacy Council to create ProLiteracy Worldwide. He now serves as Chairman of the Read it Loud! Foundation, Board Member of Leadership Council of Communities In Schools and Board Member Emeritus of the Metro YMCA of Honolulu, Hawaii. Wally Amos has been the recipient of many honors and awards. He gave the shirt off his back and his battered Panama hat to the Smithsonian Institution's Business Americana Collection. He has been inducted into the Babson College Academy of Distinguished Entrepreneurs, and he received the Horatio Alger Award, The President's Award for Entrepreneurial Excellence, and The National Literacy Honors Award. Wally is also an author who has written nine books; his autobiography, The Famous Amos Story: The Face That Launched A Thousand Chips, The Power In You: Ten Secret Ingredients To Inner Strength,Man With No Name: Turn Lemons Into Lemonade, Watermelon Magic: Seeds of Wisdom, Slices of Life,The Cookie Never Crumbles: Inspirational Recipes for Every Day Living, Be Positive, The Power In Self-Esteem: How To Discover And Fulfill Your Life Dreams, Live An Inspiring Life: Ten Secret Ingredients for Inner Strength, Watermelon Credo: The Book and The Path To Success is Paved with Positive Thinking. Over the years, Wally Amos has acted in a number of network sitcoms and appeared on hundreds of interview shows, news programs, educational programs and commercials. On the lecture circuit, he addresses audiences at corporations, industry associations and universities with his inspiring "do it" positive attitude. 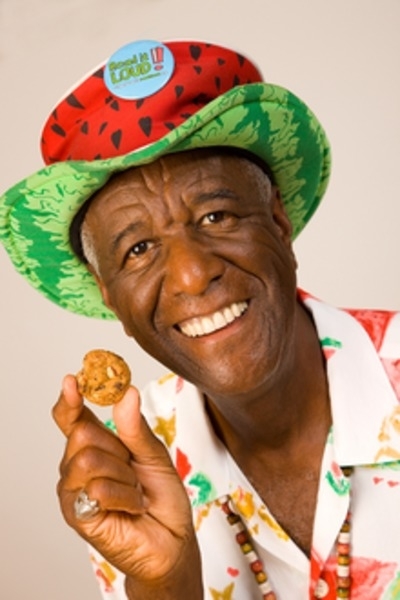 Over 150 million Americans know Wally Amos. His fame is grounded in quality, substance and a positive attitude. Wally Amos is a man of wisdom, a man of humor, and a man of joy. And he has learned the greatest secret in life: You can be happy no matter what. Wally will share his inspiring collection of "recipes," and tell you how adversarial situations are often blessings in disguise, and how the lessons we learn in life sometimes come from the most unexpected places. The Cookie Never Crumbles is Wally's philosophy, and during his lecture he will tell you, through touching, hilarious, thought provoking stories, how you can adopt this philosophy for you. From Wally's childhood, up through his days in the entertainment business, to the creation and loss of "Famous Amos" cookies, and to his current way of life, Wally Amos struggled, adapted, and finally triumphed. His inspirational advice will make you laugh, make you dream and make you think. This is a message built on faith! This program is designed to demonstrate that life is an inside job. Using his personal experiences, Wally explores the power in words, faith, enthusiasm, giving, attitude, love and other positive aspects of life to help the audience connect with their inner power. Throughout the years that he has been speaking, "The Power In You" has proven to be an excellent vehicle for building self-esteem and confidence. Drawing from his own relationships, both personal and business, Wally shares how organizations can achieve clearer communications, harmony and a sense of belonging for all employees. Because of his years of varied experiences and careers, plus his warm, personal and sincere delivery, he is qualified to show the advantages of teamwork. Wally shares his successes and his failures, which can act as a mirror to benefit your organization. When you strengthen your relationships and partnerships, you strengthen your organization. Hawaii's beloved "Cookie Man" focuses on helping people to shed the cultural stereotypes and myths that often cloud their decisions and misdirect their actions. Emphasis is placed on getting in touch with the truth of who we are now versus what we've been in the past. Participants will realize that each of us creates our own belief system and will learn how to transform the negative beliefs they may have into positive ones while simultaneously unlocking their inner power. **Fees for Wally Amos INCLUDE airfare. Hotel and meals are billed to client's account. Client provides ground.